Can We Count on Wind Power 100%? Half a lifetime ago, I wrote my MA thesis on Thomas Pynchon's Gravity's Rainbow. Pynchon's novels are notoriously difficult reads, but very rewarding for those willing to take the time to follow the bouncing ball. Part of his genius is in the way he weaves a narrative through seemingly disparate ideas using metaphor. Another part of his genius lies in forcing the reader beyond the metaphor to a deeper understanding. Metaphors: he makes them and he breaks them. The overarching metaphor (pun intended) of Gravity's Rainbow is, well, gravity's rainbow: the parabola that describes the trajectory of a rocket, as well as the rise and fall of civilizations and perhaps the human species itself. In my MA thesis, I looked at three of Gravity's Rainbow's recurring themes: entropy (from the second law of thermodynamics), technique ("the totality of methods rationally arrived at and having absolute efficiency in every field of human activity" - Jacques Ellul), and the Freudian death instinct (the unconscious desire of the animate to return to an inanimate state). How are these themes tied together by the parabola metaphor? Entropy is the destination. It is a common joke among scientists to sum up the four laws of thermodynamics (including the later-postulated Zeroth law) as "you must play the game; you can't win; you can't break even; you can't quit the game." We move inexorably toward a state of equilibrium. In thermodynamic terms, equilibrium is absolute zero. In cultural terms, entropy is the tendency for things to run down, for civilizations and empires to fall. The Freudian death instinct is the driving force -- the reason for the trip. It is our perverse tendency to act counter-intuitively and even unconciously against our best interests. All of these themes are fatalistic in nature. They're about inevitability, as is the rocket's parabola -- gravity's rainbow. Once launched, the rocket has no choice but to follow it's trajectory to it's own annihilation. But we are not rockets. And metaphors are not reality. Pynchon breaks the gravity's rainbow metaphor by applying vector calculus to the parabola, turning historical inevitability into a nearly infinite collection of individual actions, or vectors, on an arc. The arc describes the trend of history, but it is not history itself. History consists of a large number of individual acts, or individual vectors. The parabola may describe the most likely scenario, but it is only inevitable if good people do nothing to alter the course of history. Not easy, but not impossible either. When Pynchon wrote Gravity's Rainbow, nuclear annihilation was the greatest threat facing humanity. Today, an argument may be made that climate change is an equal threat. In fact, James Lovelock has made that argument. In Lovelock's view, climate change may very well be inevitable, but our reaction to it isn't, provided we have the courage to think, to assume personal responsibility, and to act consciously according to our collective best interests. *The difference between moral and ethical? Tiger Woods may be a moral man who believes that it is wrong to cheat on his wife, but he is not an ethical man, because he did cheat on his wife. Some call the human animal the rational animal, but I prefer to think of us as animals that rationalize. We don't generally start with empirical evidence, then formulate our beliefs accordingly. We start with what we want to believe, then find ways to justify those beliefs. [P]eople’s tendency to retain their beliefs, intellectual as well as religious, in the face of what strike other people as conclusively refuting arguments or clearly disconfirming evidence. When it comes to climate change, this cognitive conservatism has a huge financial upside. If you drill for oil for a living, you have great incentive not to believe in climate change, and to find justifications using pseudoscience, or to accuse others of using pseudoscience to support the existence of climate change caused by human activities. Combine this willful ignorance with the statistic that 40% of Americans (and somewhat fewer Canadians) believe, in spite of overwhelming evidence to the contrary, that the Earth is only 6 to 10 thousand years old*, and you have a pretty poor climate for rational debate. It's really no wonder that people have a hard time distinguishing between the concept of weather and the concept of climate. *Reported by Richard Dawkins in The Greatest Show on Earth. 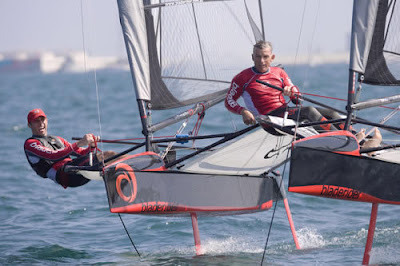 These sailing dinghies use horizontal, ultra-light, carbon fibre foils to lift the boat out of the water in as little as 5 knots of breeze, allowing the boat to travel at nearly twice the apparent wind speed. 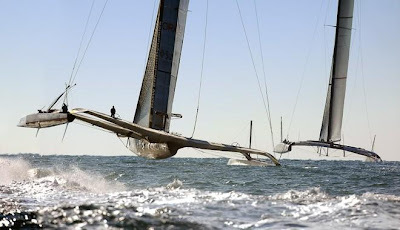 They can reach speeds of close to 30 knots (60 kmh) downwind. The Eco 60 class will also be governed by regulations designed to promote ideas to improve the ecological and environmental impact of such events on the planet. These very specific rules, to be published in the coming months, will seek to limit fossil fuel consumption and encourage wind and solar power, taking a message of sustainable living around the world. Watch the America's Cup live feed. The world of yachting illustrates the difference clearly. Just look at the BMW Oracle entry in this year's America's Cup. Boat speed has always been a critical factor in yacht racing, but this year's event takes the need for speed to new levels. Sometimes you have to look at where you've been to figure out where you're going. It's no coincidence that windmills look like airplane propellers. What would wind power look like if we started thinking about jet planes instead of propeller-driven aircraft? Something like this. FloDesign's wind turbine technology takes its inspiration from jet engines. Alternative Energy has an interesting piece on a Danish project to test the viability of 100% dependence on wind power. It turns out the answer is a resounding "yes and no." The article's author says that a small Danish island in the North Sea is a perfect place to test the hypothesis, because "the wind literally never stops blowing ." Well, no. As a Great Lakes sailor, I know how fickle the wind can be when you're not in the Roaring Forties or the North Sea. Of course you can count on wind power if you live in a wind tunnel. The real test would lie in maximizing the use of wind power in an inland environment where the wind varies from zero to 50 km/h.